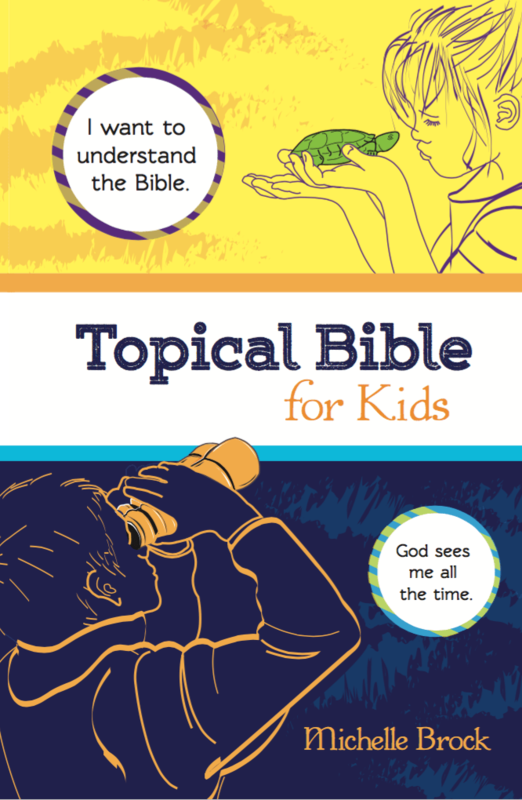 On November 1, the Topical Bible for Kids will be for sale. I hope you will read it and love it, but I’m pretty sure there will be verses and topics you won’t find! Did you know that I’ve included five blank pages in the back to add your own topics? I want to share the process I used to come up with my list of topics and verses. The process of compiling the verses was so valuable for me and my children I hope you’ll try it on your own. Write your topics as they come up in daily life. When I had a child expressing fear of being baptized, I realized I didn’t have a baptism category. When another was wrestling with loneliness after a friend moved away, I realized that my verses were inadequate for that struggle. I kept a running list, and added to it as needs arose. When I started a new topic, I asked myself what verses I knew of that might relate. Sometimes I could think of several verses right away, and other topics I had a harder time thinking of. I used www.biblegateway.com to find verses that I knew parts of, but didn’t know the reference or the whole verse. I also googled “what does the Bible say about _____” and found the open Bible website (http://www.openbible.info/topics/hope). I found a lot of verses here! I also asked myself “Are there any Bible people who wrestled with this problem or had this quality?” Again, sometimes I could think of someone right away, and other times I drew a blank. I asked my friends! “What verses did you think of when teaching your children to share?” When the Bible talks about multiple counselors, I think that comparing Scriptures together surely follows the spirit of that passage! We all have Scriptures that we understand better than others, because of our different backgrounds, the translations we use, and different teaching we’ve heard along the way. Sharing Scripture together is a delightful way to fellowship with my brothers and sisters in Christ. Finally, there is the Nave’s Topical Bible. You can find it online for free. You can also buy a print copy. I learned about Nave’s Topical Bible when I was a teenager, but when I shared it with my children, I realized it was too detailed for them to use. That’s when I started thinking about making a topical Bible just for my children. There is also the Treasury of Scripture Knowledge. It works a little differently, but it’s also a useful tool for making connections in the Bible. You can buy this in a print version, too. Do you have any more ideas or tools for finding verses on a particular topic?